This room is precious to me and I am very careful about which carpet cleaning company I have clean it. 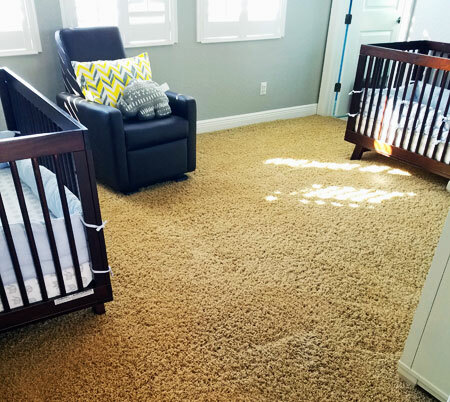 I don't want toxins in my nursery carpet. I want this room to be safe for my children. I want a safe carpet cleaning company in Tampa FL. Good news, Chem-Dry of Tampa is a safe carpet cleaning company in Tampa FL. They have over 40 green certified products that are safe to use in even your most precious room. Cleaning without toxins, soaps, or detergents is possible if you have the right solution. Chem-Dry of Tampa has The Natural a safe non toxic carpet cleaning solution that relies on the power of carbonation to clean your carpet. That's right, the same stuff that tickles your nose when your drink your favorite soda is an amazing cleaner. Carbonation is completely safe and doesn't leave anything behind in your carpet to attract dirt. Chem-dry's carbonated cleaning solution is green certified and safe for your home and mother earth. I wont let anyone else clean my carpets.